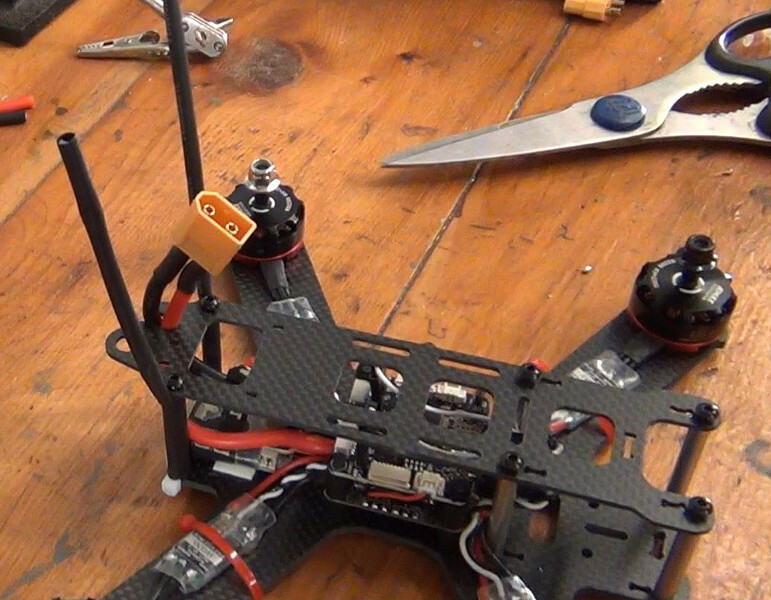 This is part 5 of our instructional series of how to assemble a racing drone. In this series, we are building a Lisam 210 frame and in this article, we show you the final steps you need to follow to get into the air. 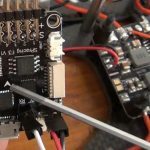 Finishing up your quadcopter involves tidying everything up. It’s in this step that you’ll normally use all sorts of odds and ends that weren’t included in your frame kit like zip ties and tape. We have a list of these parts and what they used for in our article on quadcopter spare parts. We highly recommend you take a look at that article. First up, let’s hook up your battery cable to the PDB. If your PDB doesn’t have battery leads, that starts with soldering on some 12AWG or 14AWG silicone sheathed wire to your PDB. These wires are pretty big and take a lot of heat to melt solder to. Be patient but vigilant when soldering. Hold your iron on top of the wire and gradually feed solder into it. Try not to apply too much heat to the PDB, which can cause damage to it. Next up, solder on the battery connectors. Most batteries and pilots these days use XT-60 battery connectors, so we highly recommend you do too unless you have a specific reason not to. 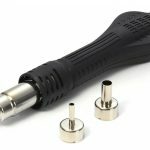 If you are having trouble soldering to the XT-60s or this is your first time, check out our soldering tips guide – it walks you through the process. You’ll want to use the connector with the male plastic part for soldering to the PDB. When soldering this part, we suggest you pair two XT-60 connectors together while applying heat to secure the pins inside of the connector so that they don’t move when the plastic loosens as you do the soldering. Next up, let’s install your RC RX. How you do this installation depends on what radio system you are using. In this build, we are using an FrSky system with a Taranis radio and an X4R-SB receiver.This receiver fits nicely on the bottom plate of the frame behind the flight controller/PDB stack, so we will be putting it there. In the past, we have also placed the RX on the top plate – whatever works best for you. Wherever you place your RX, you’ll need to secure it properly. This will most likely be done with some combination of 3M double sided tape, Velcro and zip ties. For this build, we will just be using 3M double sided tape. This tape is extremely sticky and will last through hundreds of hours of flight trouble free. Once the tape has been laid down, simply peel off the protective top layer and plop your RX down. For optimum stiction, you can clean both the frame and your RX with alcohol to make sure there are no oils or dirt which could affect adhesion. In this photo, we’ve already put the top plate on, but this is not required to secure the antenna. Finally, cut and shrink the heat shrink so that it secures the antenna to the zip tie. 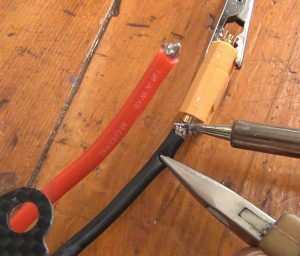 Make sure you do not cut the tips of the antenna – these are the only parts of the whole thing that matter and cutting even a little bit will drastically reduce your radio reception range! 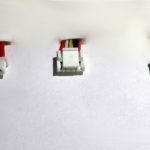 Now is the time to clean up your wiring as much as possible. 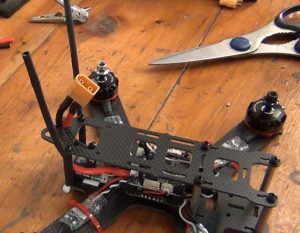 Use zip ties or tie wraps to hold your wires together and mounted to a secure part of the frame so that they cannot be pushed into the props in a crash. There is nothing worse than having wires contact props – the repairs can be very hard to perform and often times will result in broken electronics. Once you’ve gotten all your gear and wires stowed away securely within the protective confines of the frame, it is time to install the frame top plates. This isn’t too difficult in itself – just install a few screws. The problem is that sometimes you’ll need to make adjustments when you install it. Sometimes the locations where you mounted components cause the top plate to not fit properly, other times you simply built your flight controller / PDB stack too high. In this build the latter happened to us and we had to shorten a few pins and servo connectors to get the top plate to seat properly. You’re probably starting to get pretty excited at this point. 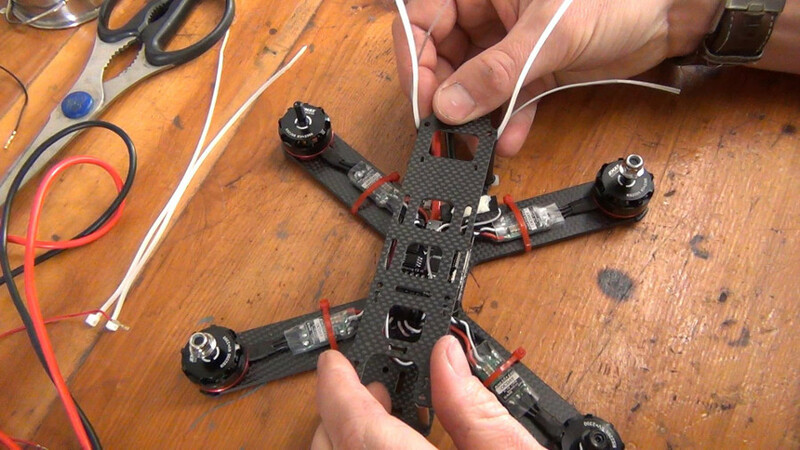 Your quadcopter is really taking shape and looks like it’s ready to hop off of your work bench. Now that everything is wired up and secure, it is as good a time as any to test out your electronics to make sure everything powers up and there are no shorts. Ironically, the smoke stopper “popped” on this build. The cause was a defective ESC. It’s likely that had we not used the smoke stopper more damage would have been caused to the PDB and possibly the other ESCs. 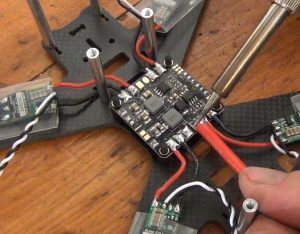 In our ESC article, we recommended that you don’t shrink your heat shrink covering the ESCs until after you’ve powered everything up. This way if you need to make changes you don’t waste the heat shrink and the effort. Well, now you’ve powered your quadcopter up and (hopefully) it’s working fine. Time to finish the ESCs! Editors note: You may have noticed we have already finished the ESCs in the pictures above. This is because we completed this step early in this reference build. Do as we say and not as we do! First up, shrink the protective heat shrink covering the ESCs. To make the ESCs more water resistant, press the ends of the shrink together after heating. This causes the heat shrink to stick to itself, sealing up the electronics inside like a burrito. Next, secure the ESCs to the frame. You can use any number of ways to do this: zip ties, double sided tape, electrical tape or velcro. We are using zip ties in this build because we like the look. One zip tie is generally pretty good. As you will notice, the ESCs don’t actually have a lot of room to move around once everything is sealed up. Securing them is more about relieving strain on the wire than protecting the ESC from the props. Last up, you’ll want to add a way to secure your battery to your quad. This involves two steps. The first step is deciding where to put the battery. On many quads you have the option of mounting the battery on the top of the bottom. Both options have their pros and cons. Mounting the battery on the top is our recommendation for most beginners, if your frame supports it. 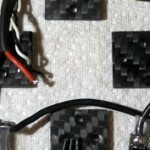 Mounted this way, your battery will be well protected from most crashes and your quadcopter will be much easier to land. The problem is in this orientation, the batteries wires are very vulnerable to being sucked into the props and being destroyed. We can’t count the number of expensive LiPo batteries we have lost this way. Mounting the battery on the bottom on the quadcopter is the other option. In this orientation, you drop the center of gravity for the quad, causing it to be more stable in flight. This causes a noticeable improvement in flying qualities for racing and other forms of precision flight. In this location, the battery wires are also far more protected from the props. 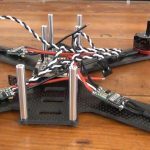 The downside is the quadcopter becomes much harder to land and takeoff and the battery becomes vulnerable to being crushed by the quadcopter in crashes. Whichever orientation you choose, you’ll want to secure your batteries in two different ways. The first way is a battery strap. The strap is the main source of structural strength holding the battery to the quadcopter. It is all but required. The second way of securing your battery will need to be in such a way as to prevent it from sliding forward and aft. There are a couple of good ways to do this but our favorites are using industrial strength velcro or anti-slip tape. Velcro has the added benefit of providing some holding strength if the strap fails. And that’s it! 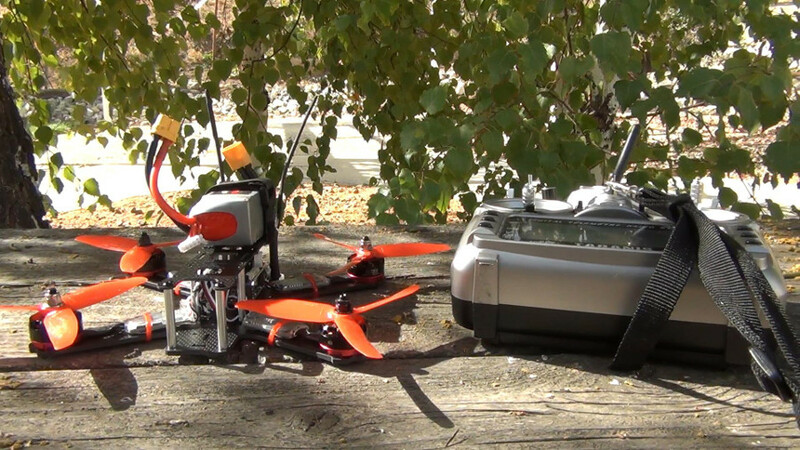 You’re ready to do the software setup on your quadcopter and get out and fly. On the other hand, if you are aiming to fly FPV, you can go to part 6 where we cover adding an FPV system!